One is a simple child's plaything. The other operates the TV and all of its accouterments. If, in the haste of dashing to change the channel to destroy all chances of being forced to watch yet another episode of Dora the Explorer, you grab the wrong one and press a button only to hear "C is for Cookies... Yum, yum yum..." shouted by a burly puppet, you will feel unbelievably stupid. But I digress. Make sure you have the right piece of handheld plastic at all times. 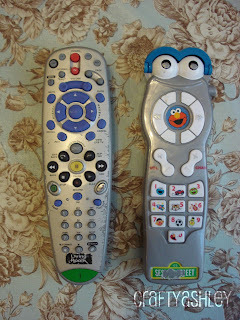 It's no fun searching for the remote after the kids have all taken their leave for the evening. Only to find said remote packed away in a toy bin. At the bottom. The very bottom.